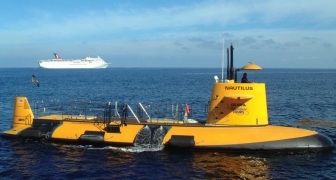 Willard has a rich heritage of designing and building unique excursion vessels that enable people to do everything from deep-water diving to ocean rafting, sight-seeing, snorkeling and viewing marine life under water. Our rugged rigid hull inflatable boats have been used in Hawaii for decades to host thousands of tourists on daily rough-water adventures, while larger vessels such as our 65’ Semi-Submersible glides through the beautiful coastal waters of Catalina Island in California, allowing the passengers to view the local sea life without getting wet! Willard secures the appropriate United States Coast Guard approvals when necessary, and will closely collaborate with you to develop the next great excursion vessel. 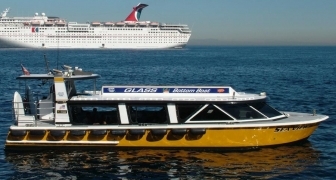 Please contact us for more information about our Excursion Boats. Launched and very profitably operating is the first semi-submersible, 49-passenger viewing vessel completely built in high-strength, low maintenance fiberglass reinforced plastic. Boat number one, named SS NAUTILUS, was constructed at the Willard Marine facility in California for Catalina Adventure Tours, Inc., which serves thousands of annual visitors to Avalon, Catalina, enabling them to explore and view the beautiful coastal island waters and sea life. An investment has been made in the molds for this vessel so that sisterships can be constructed and receive U.S. Coast guard passenger approval in an expeditious and cost-effective manner. This vessel is the perfect destination activity for those in the tourism industry. In the right operating environment, this unique vessel will amortize its capital cost in two to three years. The revenue from the special Fish Feeder Concession option can pay for the cost of crew. The perfect vacation activity for cruise ship passengers and tourists near ocean harbors to view colorful underwater coves, reefs, plants and fish from a glass-bottom boat. U.S. Coast Guard approved to carry 49 passengers, one operator and one crew, this boat is constructed of fiberglass for the lowest in maintenance and operating costs. Viewing windows are arranged two aft, port and starboard; two amidships, port and starboard; and one forward. All five viewing windows have wrap-around seating. A fixed canopy covers the passenger area. 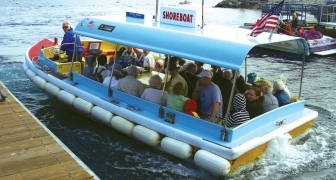 This 40′ passenger boat is USCG approved for 49 passengers. This is a perfect ship to shore passenger boat for the cruise ship industry or tourist trade. With seating in the fore and aft sections of the boat loading and unloading passengers is done with ease. 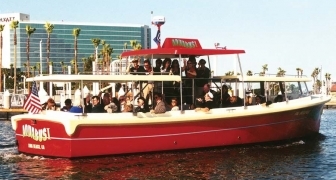 The Island 30 is a USCG approved passenger vessel that can accommodate 47 passengers. This boat is ideal for the cruise ship industry or harbor taxi service for bringing passengers to their shore destinations.